At the Law firm of SINDLE & LONG, we are committed to two fundamental assets for each client: Experience and Excellence. 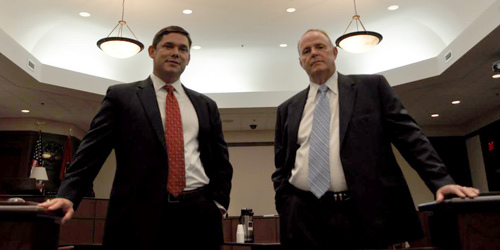 For over 40 years collectively, Mr. Sindle & Mr. Long have represented clients in Sumner County and other counties across Middle Tennessee bringing real Courtroom experience to each case and continuously striving for excellence in their representation and the results delivered. Dear, Chad. I just wanted to take a moment to thank you for all your help during my whole ordeal. I know that it is your job to assist people during legal woes, but your understanding and kindness towards me during a very embarrassing moment allowed me to face all this in a more positive light . seeing it as a stumble in life and not a face-plant! I will definitely call you if I ever need you again and most definitely refer you as a great person and attorney. "My family has worked with Chad on a couple of different occasions and we were extremely pleased with the outcomes of each case. His confidence and reassurance immediately put me at ease the first time we met. Later, we had another occasion to call upon his services and Mr. Sindle was working with Chad at this time. Quite honestly, the two working together delivered a "knock out punch" and the outcome of that case was better than we could have even hoped for. They made us feel that we weren.t just "clients", we were friends. I found them to be very caring and understanding with us, while being very tough and knowledgeable in the courtroom. I have all the confidence in Mr. Long and Mr. Sindle and will continue to ask them to handle all of my legal issues in the future." I would like to take this time to thank you and your assistant Brittney for all the care and compassion you have shown to me and my case. I have worked with attorney's before; And, I would like to express that there is a distinct difference in the way myself and my case were treated by your office as opposed to others. This care and compassion meant the world to me as my life was in turmoil. Thanks to you, Mr. Long, and your wonderful assistant Brittney, and to the compassion, concern and care shown by you guys in the interest of my case— my life—your help has begun the process of clearing the turmoil, stress and uncertainty that once lay ahead for me. I am forever grateful. Thank you doesn't seem to say enough, but nonetheless, THANK YOU!! I want to thank you and also the person at Sumner County court system for giving my son the chance to go to Synergy and get his life back on track. We as parents are very proud of him but without your help, who knows where he would be today. Mitchell will be celebrating his 25th birthday on Sunday and I pray he has many more. He will be coming home for a visit soon not sure when but if he has time I know he would like to see you. I pray you and your family are doing well, and if there is anything we can do for you, please let us know. I hired Chad Long to help me with a very difficult and ongoing personal case. It was by far the best legal decision I ever made. Chad made sure I understood everything and explained things in terms I could understand. I was upset at how long the case was taking; and when Chad took over, it was handled extremely professionally and in record time. He achieved the exact outcome I wanted when the case was started and was very knowledgeable about the entire process. I knew he had been voted as the best attorney in Sumner County Tennessee many times, and he went above and beyond my expectations showing exactly why he is the best. His staff was more than friendly and helpful at all times, and it made the whole confusing process so much easier. If I ever need an attorney again, I will be right back in his office. Thank you so much for everything.